Richard Gasquet has been cleared of any wrongdoing by the Court of Arbitration for Sport (Cas) over his doping charge. The Frenchman, 23, tested positive for cocaine in March and was handed a provisional 12-month ban by the International Tennis Federation (ITF). Cas rejected an appeal against the decision to overturn the ban from the ITF and the World Anti-Doping Agency. "I am totally relieved. I went through a nightmare for eight months," Gasquet told French TV channel Canal Plus. "I am happy to be 100% cleared. It was very difficult for me, I'm glad it's over. "Mentally, it was very tough. I could have done without all this but now I'm happy to be back on the tennis courts. My goal is to make it back into the top 10." The ITF and Wada had wanted the world number 47 to be banned for up to two years. Cas said: "The panel decided to dismiss the appeals after having found that in this particular case Richard Gasquet had not committed any fault or negligence within the meaning of the ITF Anti-Doping Programme." 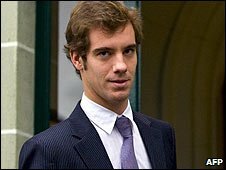 An ITF panel found Gasquet guilty in July but accepted his explanation that the substance got into his system inadvertently after kissing a woman in a Miami nightclub. The tribunal supported his claim and felt that because "no more than a grain of salt" was recorded in the sample a long ban would have been an injustice. ITF president Francesco Ricci Bitti admitted that the federation was "disappointed" with the verdict, but could not take the issue any further. "Cas is the ultimate arbiter of such appeals and so the ITF must respect and abide by its decision," he said. "The ITF also recognises the potential implications of the Cas decision with respect to future decisions and will discuss these with Wada." Deblicker expects Gasquet to start the 2010 season with warm-up tournaments in Brisbane and Sydney ahead of the Australian Open on 18 January. The former world number seven tested positive following a urine sample at the Sony Ericsson Open in Florida in March, after he withdrew from the tournament because of a shoulder injury.